A floppy disk or diskette is a format that is used to store digital information. Unlike optical discs that are recorded and read with the light from a laser, floppy discs are read with magnetic heads. The term floppy is used because the actual disk that stores the digital information is a round and thin flexible disk. More information on the disk structure is provided here. These magnetic disks have a long history. It all began in 1967 when the floppy disk drive was invented by Shugart at IBM. This first drive was for 8-inch floppy disks and was a read only drive. Later more formats were introduced as shown and discussed below. The first read only disk was introduced in 1971 by IBM and was eight inches in size. In 1972 the 8-inch read/write disk was developed. Different versions of the 8-inch disk format continued to be introduced until about 1977. The use of the 8-inch format continued up until the late 1980s. It is difficult to find working eight inch drives nowadays and of course, no new 8-inch floppy disks are being produced. This diskette is housed in a flexible vinyl plastic enclosure or jacket. The purpose of this jacket is to keep fingerprints off the disk surfaces and to limit the amount of dust and debris that gets on the diskette surfaces. 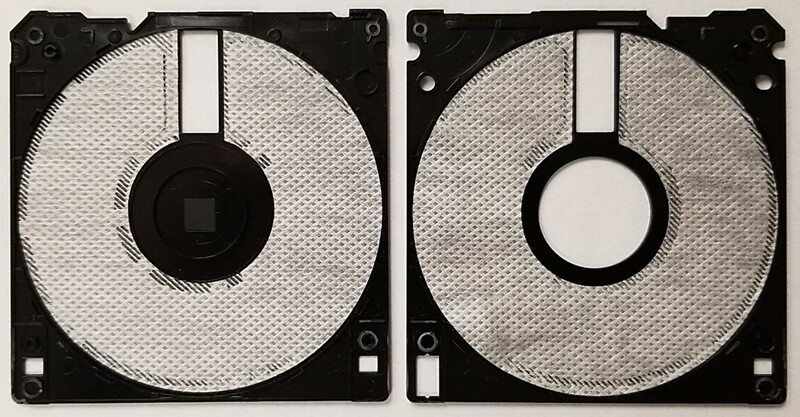 The presence of debris on the disk can lead to scratches on the disks and lost data, damage or contamination of the magnetic heads in the floppy drive, or simply errors when the floppy disc is read. Information on proper floppy storage and handling is provided at the disk storage page. 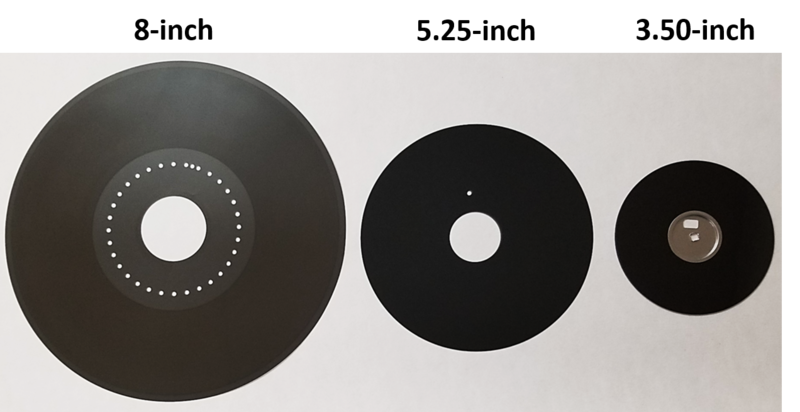 Although the vinyl jacket is sealed so that the disk cannot be easily removed from its enclosure, a certain area of the floppy disk is exposed via cut-outs in the jacket so that the magnetic heads can read or write information to the disc. The inner portion of the vinyl jacket contains a woven liner with a lubricant. This reduces friction because when the disk is being read or written on, it is spinning and the magnetic heads are in contact with the disk surface. The liner also helps to keep the diskette surfaces clean by removing any dust and other kinds of debris when the disk spins. The 5.25-inch floppy diskette was introduced by Shugart in 1976 and several varieties were produced. The last new five and a quarter inch disk format came to the marketplace in 1986. Use of the 5.25-inch disk continued into the late 1990s but production of the 5.25-inch floppies has ceased. Although new computers have not come with 5.25-inch floppy drives for a while now, some drives are still available in old working computers. It is a good idea to hold on to these working drives and computers in order to be able to access old files stored on this format. Like the 8-inch version, the 5.25-inch disk is housed inside a flexible enclosure jacket with openings for the read/write magnetic heads. The 3.5-inch disk was introduced in 1982 by Sony, with the last version being introduced in 1999. For a while in floppy diskette history, computers could be purchased with both 5.25-inch drives and 3.5-inch floppy drives. Nowadays, very few new computers come with 3.5-inch floppy diskette drives, although some computers still exist with working drives. Some 3.5-inch floppy disk media are still available but on a very limited basis. 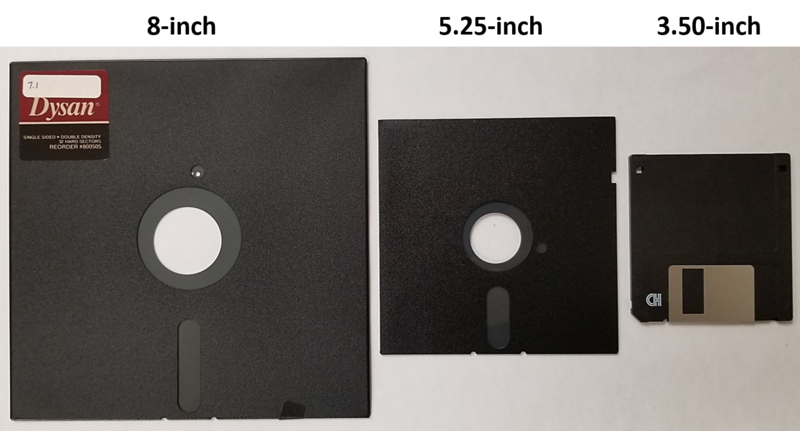 A much smaller disk than the earlier 8-inch diskette, the 3.5-inch floppy disk has a major advantage over the previous two sizes. This format of diskette comes in a rigid plastic housing. The rigid plastic housing provides a greater amount of physical protection for the disk because the enclosure is very difficult to bend. Therefore, no creasing of the thin flexible disk or wrinkling occurs, which would lead to many read errors and likely an unreadable disk. The 3.5-inch disk jacket is better sealed when compared to the flexible plastic jackets. There is an opening for the magnetic heads, but this opening is covered with a metal sliding gate. When the floppy disk is placed in the floppy drive, the gate slides open and exposes the diskette surface to the read heads. This sliding gate is open only when the magnetic disk is in the drive and therefore, less dust and debris gets onto the diskette surfaces and consequently less physical damage and read errors occur. Another format that falls into this floppy disk category is the Zip disk, which is essentially a higher capacity floppy diskette. The 100 MB format was introduced in 1994. Later the 250 MB format was introduced in 1998 and then in 2002 the 750 MB format. Because of the much higher capacity of the Zip disk, most believe it is not a floppy disk, but it actually has the same structure as regular floppies. More information can be found at the Zip disk page. 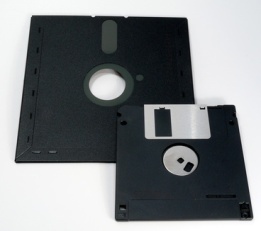 The capacity of the various sizes of floppy disks varies depending on whether the diskettes are single sided, double sided, double density, high density, or another designation. More details on capacity are provided here. However, the maximum capacity is low compared to other storage media and therefore not very suitable for digital scrapbooking storage projects or for most of the digital files being generated nowadays. Regardless of the floppy disk format, the technology is old and has been superseded by newer, more cost effective, higher speed, and higher capacity formats. Any information stored on floppy diskettes should be copied as soon as possible to another storage medium, before the drives to read the disks disappear.